Presented here is a collection of three game used New York Mets jerseys from the 2007 MLB season. The first jersey, a blue pinstriped button-down home jersey, was worn by Guillermo Mota on September 15th, 2007. Mota came in during the ninth inning of this game, a 5-3 Philadelphia Phillies victory, and retired Aaron Rowand and Jayson Werth to send the game to the bottom of the ninth. This jersey has Mota’s number “59” sewn on the chest and back in blue, orange, and black tackle twill. 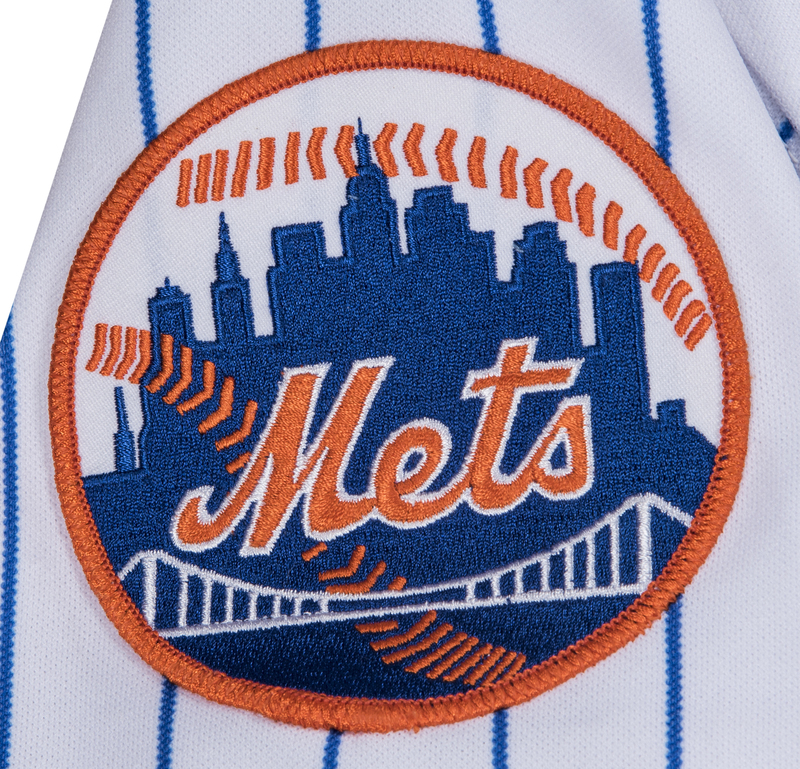 “Mets” is sewn on the chest and “MOTA” is sewn across the back shoulders in the same fashion. 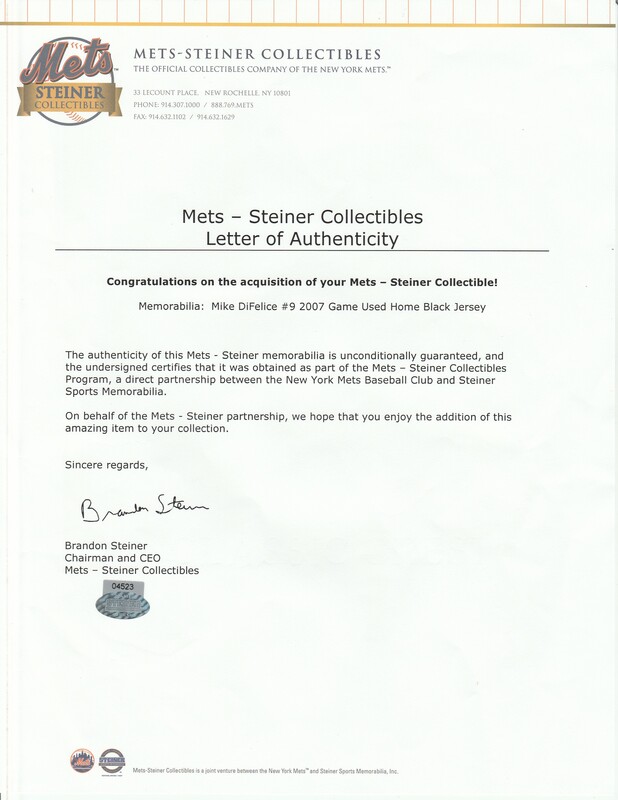 This size “52” jersey comes with a MLB Authenticated hologram (BB 521700) and a LOA from Mets-Steiner Collectibles. The second jersey in this lot, a white button-down home jersey, was worn by Rick Down, the hitting coach for the Mets in 2007. This jersey has Down’s number “54” sewn on the chest and back in blue, orange, and black tackle twill. 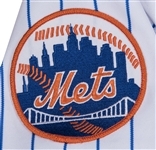 “Mets” is sewn on the chest and “DOWN” is sewn across the back shoulders in the same fashion. This size “48” jersey comes with a LOA from Mets-Steiner Collectibles. The final jersey in this lot is a black Mets jersey worn by Mike Difelice in 2007. The jersey has “Mets” and Difelice’s number “9” sewn on the chest in blue, white, and orange tackle twill, while “DIFELICE” and a second “9” are sewn on the back of the jersey in the same fashion. 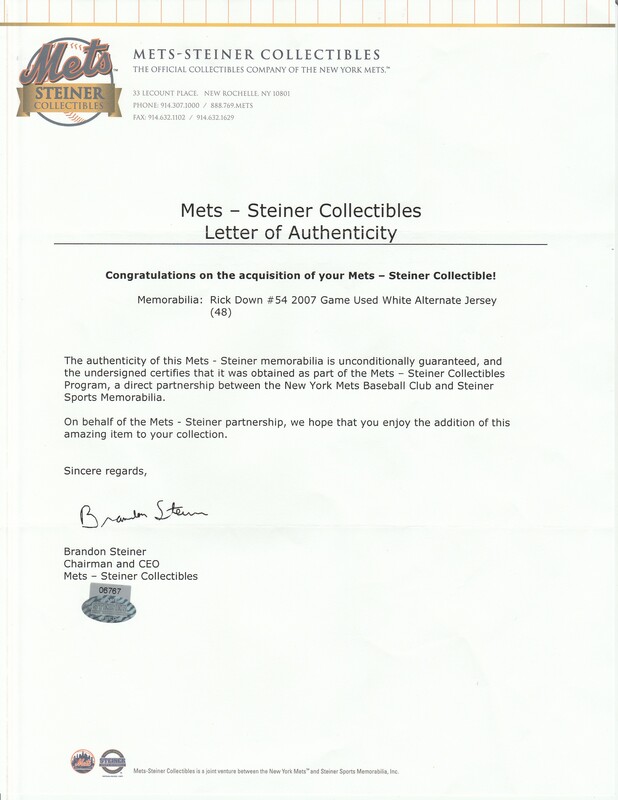 This size “48” jersey comes with a LOA from Mets-Steiner Collectibles.